This book is published in an 8.5 x 9.25 jacketed, hardcover format with 144 full color pages. 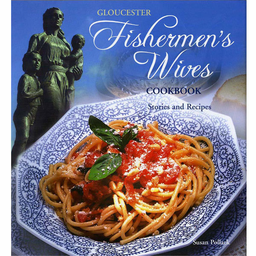 It is comprised of 22 heartening profiles and stories of members of the Gloucester Fishermen's Wives Association and 173 of their traditional European and American recipes for seafood and a variety of other appetizers, entrees and desserts. A portion of every book sold goes to the Gloucester Fishermen's Wives Association to fund their efforts towards the conservation of New England's fishing grounds and improvement of working conditions for fishermen.